Most of humanity still believes that it is superior to the other creatures on the planet and that animals are here for our use. Clearly, we are superior in intellect, linguistic skills, and tool-making ability, and the bible implies we are the only creatures with a soul. So, for the most part, we ignore evidence that many animals have intelligence and emotions not necessarily too dissimilar from our own. Elephants, chimpanzees, dogs, cats, and many other animals have shown the ability to feel what appears to be love, anger, fear, happiness, boredom, excitement, depression, compassion, and pain. They have shown the ability to recognize individuals, to sense our various emotional and physical states, and to care for and help us. Charles Darwin was one of the first scientists to write about the existence and nature of emotions in non-human animals. Yet, scientists do not generally agree on the extent of these emotions because there are no widely accepted, objective scientific tests that can conclusively prove their existence one way or another and we lack the ability to communicate with animals in a sophisticated way. However, anyone who has ever owned a pet, worked with primates, or read compelling anecdotal accounts or anthropological studies on such creatures understands that these emotions are present. Two excellent books addressing the evidence of animal intelligence and emotions are Dogs Never Lie about Love, by Jeffrey Masson and A Reason for Hope by Jane Goodall. Rather than restate their extensive and compelling evidence, let’s just assume that animals, to a varying degree, are intelligent and possess emotions. The fact that we continue to look for evidence of intelligent life on other planets while we virtually ignore the intelligent life on our own is curious. Sure, we may be the only creatures here who have a sophisticated method of communications and the resultant ability to share knowledge. But what if intelligent life on other planets is so far advanced over our own, that they have absolutely no interest in us? Even if they could find a way to communicate with us, would they even care to do so? What would be the point? The chance that there is something they can learn from us would be negligible and what would be the point of trying to teach us about their way of life? Maybe we are just too violent and limited in intelligence to even benefit from their teachings. Alien species may be as far advanced above humans as we are over chimpanzees. Do humans try and communicate with chimpanzees in an attempt to establish a code of behavior appropriate for a creature of our higher intelligence? We have taught some how to use sign language, but do we believe they have rights equal to those of humans? Have we tried to develop and teach them a code of chimp behavior? Chimps have been known to initiate brutal attacks upon members of their own group or other groups over territorial disputes or what appear to be simple grudges or jealousy, but do we really care? Obviously, we don’t care about the lives of most other species. Cats and dogs are partial exceptions, but we still continue to use them by the hundreds of thousands per year to test toxic products and new medicines. Aside from this, we like to take care of our pets, but what about other creatures? If we were ever able to find a way to communicate with insects, would we try and convince worker ants or bees that they don’t have to live as slaves to an all-powerful queen? Have we ever tried to find a way to persuade lion prides to respect clear, negotiated borders rather than fight over land? Do we intercede in the wars between neighboring groups of chimpanzees or gorillas fighting over territory? No. We assume there is no effective way to communicate with them about such things and we are probably right–at least for now. We merely observe, take notes, and remark on how only we humans can resolve our differences through communication, learning, empathy, and caring. Although I can’t really say that has really worked for us so far. If we don’t care about the lives of wild animals, what makes us think aliens would care about wild humans? 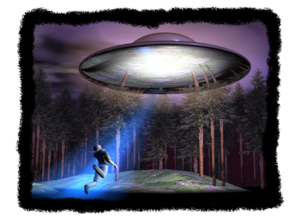 Many people have reported being abducted by aliens and being forced to endure experiments or medical procedures, including impregnation and the birth of hybrid children. 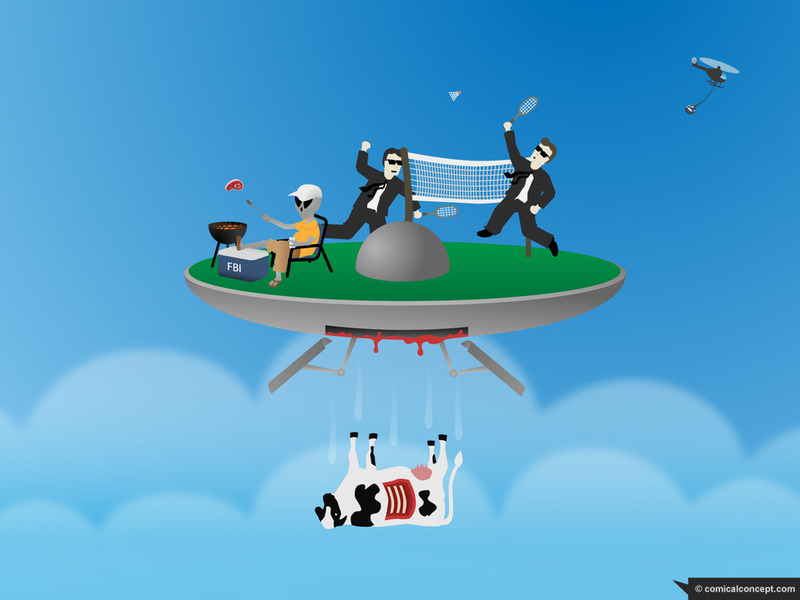 Then there is the unexplained yet widespread phenomenon of weird cattle mutilations. If aliens are visiting Earth, it sounds to me like they have a very different concept of human or animal rights. 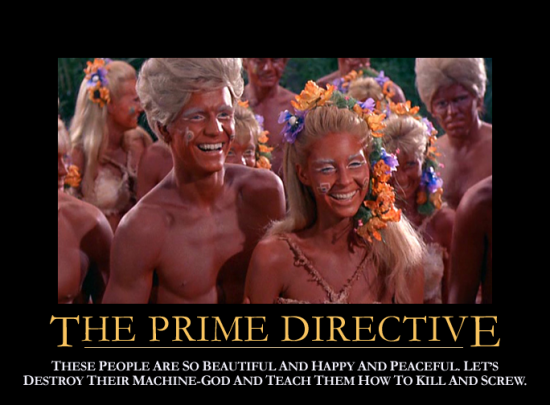 Remember the “Prime Directive” from Star Trek, which is the rule that humans must not interfere with the internal development of alien civilizations until they are ready for space travel? Maybe the real Prime Directive for alien visitors to Earth is that a species can use and interfere as much as it wants with the development of another species, but should try and keep from getting caught and sparking a global panic. What would happen if governments of the world confirmed that Earth was being visited by meddling aliens who frequently scoop some of us up to conduct genetic or other medical experiments? Naturally, I think that many would instantly panic. People in isolated rural or suburban communities would feel the most vulnerable even if we were all equally at risk, so there would be a rush to migrate to the cities, leading to overcrowding, violence, food shortages, and unemployment. People would act like cornered animals and attempt to defend themselves by purchasing weapons and setting up 24×7 neighborhood security patrols, even though we know this would be completely ineffective. Criminals would take advantage of a newfound fear of the dark. The transportation system might break down as people started to fear traveling in the dark. We would see a drastic increase in anxiety and tension, which would manifest itself in irrational behavior and create a more dysfunctional society. Is there any wonder why governments have been accused of suppressing and confiscating all evidence of alien visitation? Eventually, however, society would adapt to the new reality and try to cope. Wasteful spending on homeland security would be replaced by “global security” as the major world powers spend trillions of dollars on useless surveillance and defense technology that the aliens can easily bypass or defeat. The major religions of the Earth will adapt, as usual, to changing circumstances, by clinging to scripture and a belief in god while widening the scope of god’s creation. They may even welcome the aliens as angels sent to test or punish us for our sins, or may consider them demons to be resisted. In any case, the world will go on and most people will continue to die from disease and car accidents, not from alien activity. Eventually, the nations of Earth will settle down and continue to fight amongst each other over terrestrial resources while a small few plan their migration to the stars. This entry was posted in Animal Intelligence, Extraterrestrials and tagged alien abduction, alien conspiracy, alien visitation, animal emotions, animal intelligence, cow mutilations, prime directive on June 30, 2014 by EarthVisitor. People have believed for a long time that elephants exhibit empathy and altruism and have a long memory. That is, they appear to remember people who treat them well or badly. Certainly a good memory is some kind of sign of intelligence. But what do elephants think about with this great memory? A group of researchers in 2006 decided to create a test to see if elephants had any sense of self-awareness. They did this by building a large, strong mirror made of plastic framed in steel and placing it in a cage at the Bronx zoo. Three female elephants immediately began examining the mirror and looking to see what was behind it. They also examined the insides of their mouths, studied their ears and showed other signs of self-recognition. One of them also felt his forehead for an X that had been painted there, which is a classic test of self-recognition invented 35 years ago by biologist Gordon R. Gallup, Jr. 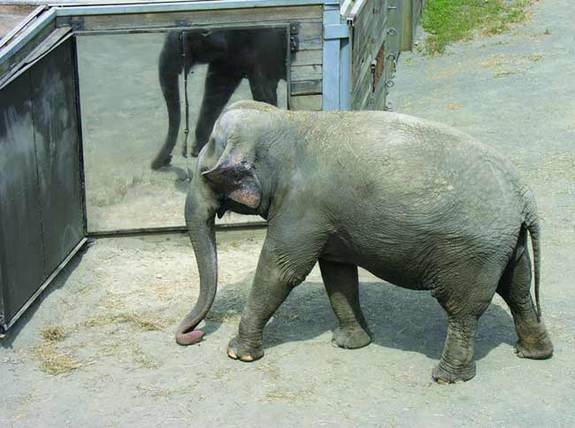 This is strong evidence that elephants can understand the concept of a reflection and how it can be used, yes like a tool, to examine parts of their body previously inaccessible to them. This seems to be a pretty basic first step, but I’ve got many more questions. Do they care about how they look or is it just something to do because they are in captivity and bored? Is it possible that they might enjoy having their face painted? If we could let them watch as someone painted their face and then show them how to wash it off, what would they do? Would they keep the makeup on or wash it off? I wonder if they would enjoy watching movies of themselves. Would they fondly remember a happy day from their youth and recognize themselves as they played with their friends? Would it stimulate them to play again? Would they feel sadness seeing movies of lost loved ones or joy at the thought that they could see them again? Would they start looking for their missing loved one or would they understand the temporal difference between past and present? Can they anticipate future events? Can they be taught that a particular action, like the ringing of a bell, is an indicator of some future event that is about to occur? I’m pretty sure this is the case. Are they be smart enough to try and trigger the event by ringing the bell themselves? Elephants also have very complex social lives. I remember a documentary about how poachers killed all the older males in a particular region for their ivory tusks, leaving the young elephants with no elder male supervision. The adolescent elephants started to act like a bunch of irresponsible teenagers, trampling farmers’ fields and attacking and killing rhinos and other animals. When some older bulls were brought in from another region, they effectively put the young ones in their place. They served as surrogate fathers and stopped the rampaging. Does this mean that older elephants have some concept of morality or have learned the consequences of irresponsible behavior? Do they consider it wrong to kill rhinos and other animals that do not threaten them? Why else would they care what the young bulls did unless they perceived a challenge to their leadership of the herd? Have they learned that people are dangerous and that they will fight back if their territory is invaded? I’m pretty sure that an elephant would remember someone who did something bad to them and therefore can hold a grudge. But this is probably also the case for many other species. In a TV documentary called The Meerkats, the female leader of the family clearly showed a willingness to hold a grudge for a long time. In one of the episodes, she attacked and expelled one of her female offspring for getting pregnant. Apparently, the leading female is the only one allowed to get pregnant. In episode after episode, it became clear that she would not let her daughter back into the family. When her daughter tried to return or to protect her young from abuse by the others, the leader would viciously attack and expel her again. The daughter apparently was desperate to return to the group, but was shunned by everyone. So, even the lowly Meerkat shows the ability to have individual relationships that may demonstrate emotions such as anger, jealousy, fear, sadness, or remorse. I think we need to stop asking ourselves which animals have emotions and intelligence and acknowledge that they all probably have some level of both. The real questions are more involved but more difficult to answer. What emotions predominate? What do they understand and remember? How do they communicate and learn? How can we better communicate with and live alongside them? This entry was posted in Animal Intelligence and tagged animal intelligence, elephant cognition, elephant self awareness, mirror test, the meerkats on June 18, 2014 by EarthVisitor. What differentiates humans from other species? Clearly, the opposable thumb is an important characteristic. Could you see a cave man trying to throw a spear without a thumb? How far do you think our brains would have been able to take us without the ability to create and use tools? OK, maybe we would have found a way, but it might have been very limiting. 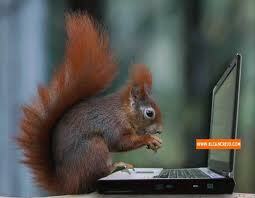 Are there other intelligent creatures all around us that merely lack an opposable thumb? What about dolphins? Apes have a huge advantage over other creatures since they do have the opposable thumb, but we don’t believe they have all our complex reasoning skills. They do appear, however, to have most if not all of our emotions and social skills. They experience love, anger, compassion, and fear. They are leaders, followers, and family-oriented (at least the females are). If they could just develop language skills, they might even be able to build an advanced society to compete with us. So, what really is the difference between an ape and a mentally impaired, mute human? Do apes also have more social skills than a severely autistic person? People often claim that the ability to use tools and pass on knowledge distinguish humans from animals. But what they don’t tell you is that some animals can also do both. They just don’t have the intellectual or physical capacity to manufacture tools. For years, chimpanzees and orangutans have been known to use primitive tools such as rocks and sticks to perform specific tasks. While they are only able to use basic objects such as rocks for simple tasks such as crushing shells, it shows that they understand the benefits of using objects to help with specific tasks. They are also able to teach their young how to use such tools. Now, gorillas have been added to the list as they have been observed using sticks to test water depth and using branches as a makeshift bridge. In June 2005, scientists also identified the use of tools by dolphins. Some female dolphins use marine sponges to help forage for food and they pass this knowledge on to their female offspring, which spend a lot of time with their mothers. The dolphins wear the conical-shaped sponges on their nose while foraging along the seabed. While nobody yet knows how this helps them to feed, it seems that they have a different diet than other dolphins that do not use the sponges. Dolphins are now the first non-primates known to be able to use tools and pass on the learned behavior to their offspring. Chimps are also known to be able to participate in more complex behavior. In experiments, for example, they are able to learn the benefits of pulling or pushing levers in order to feed themselves or others. In some experiments, they show an ability to work as a team by pulling a lever that can only be used to feed another chimp. Why do they do this? Because they understand that the other chimp can also pull a lever that will feed them. When they mutually feed each other, they are happy to work together to their mutual benefit. But if one chimp fails to reciprocate, then the other shows signs of anger and resentment and will refuse to cooperate as well even after the other animal later decides to cooperate. See the book: Dogs Never Lie About Love. Cats and dogs, raccoons, bears and other animals are also known to be able to turn doorknobs to open doors, which shows the ability to learn from watching humans. Clearly, some animals are intelligent and have a good ability to learn and remember people, places, and the purpose or use of objects. This entry was posted in Animal Intelligence and tagged animal intelligence, animals using tools, ape intelligence, dolphin intelligence, opposable thumb on June 18, 2014 by EarthVisitor.